Have you ever wondered how many photos of outstanding atmospheric phenomena may exist “out there” without us knowing about them, just because they are not posted on our regular websites, blogs or forums? From time to time, I do Google image search queries on atmospheric optics related subjects to see if something interesting and yet unknown might show up. Some weeks ago, I encountered this way a true rainbow rarity on a Japanese website. The picture had already been publicly accessible for over two years, but went unnoticed by the European or US atmospheric optics community so far. Using the automatic translation function I identified the photographer and contacted him to learn more about his (as of now) unique observation. Kunihiro Tashima noticed an approaching rain shower on the evening of August 5th, 2012, in the town of Yobuko, Saga prefecture, Kyushu island, Japan (33.54° N, 129.90° E). According to his experience, these showers appear quite regularly after sunny days in the Japanese summer. At 18:24 JST he took the first photographs of a marvellous rainbow display made up from a triple-split primary and an undisturbed secondary (photograph 1, unsharp masked; photograph 2, unsharp masked) from a parking lot. Kunihiro used a Nikon D7000 camera equipped with either a AF-S DX NIKKOR 18-55 mm or a Tokina AT-X 116 PRO DX II 11-16 mm lens at 18 mm and 11 mm focal length, respectively. The sun was located at 9.7° in elevation and 283.8° in azimuth when these pictures were taken. Within the next minute the shower intensified at his position, so he had to withdraw into his car. Photos taken at 18:25 through the windscreen give the impression that the middle branch had by then already merged with the uppermost one, resulting in a rather broad “traditional” twinned rainbow (photograph 3, unsharp masked). Around 18:32, only an ordinary single primary and a weak secondary were left in front of receding clouds and the blue sky (photograph 4, unsharp masked). At this time, the sun’s position was 8.1° in elevation and 284.9° in azimuth. Twinned rainbows are nowadays a well-documented phenomenon  and several promising steps have been taken to explain their formation [2, 3]. In one of my earliest reports on simulations of rainbows generated by flattened drops with broad size distributions, I pointed out the idea that also split rainbows with three or four branches might occur at very rare occasions [4, p. 117]. However, up to now, no photographs or clear observation records of such highly exotic rainbow displays have been known to the community. Some old reports of multiple rainbows do exist , but these are difficult to evaluate due to the lack of further details. 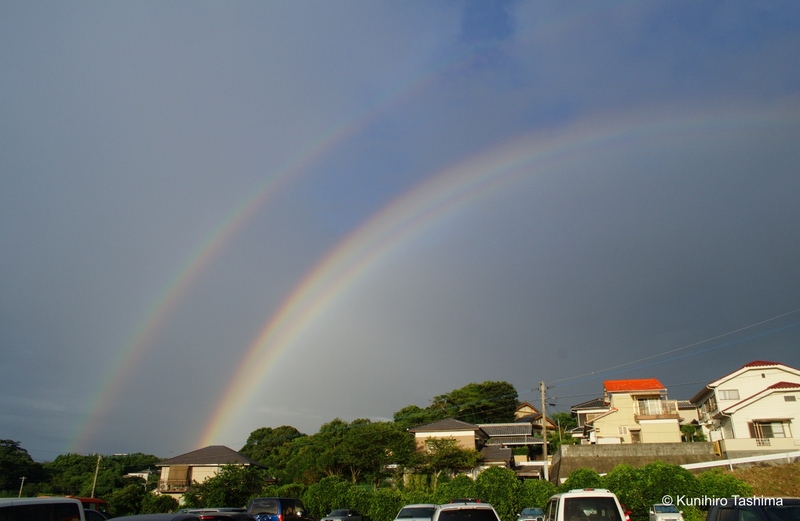 Hence Kunihiro’s photos provide to my knowledge the first reliable evidence that multi-split (>2) rainbows exist. A reflection rainbow generated by mirrored sunlight from a horizontal water surface can be excluded as an explanation here, since the angular deviation from the original bow would have to be larger at this solar elevation. Furthermore, the secondary bow remained unaffected by any anomalies, which is a familiar feature seen in many split rainbow displays. For further analyses it is necessary to assign scattering coordinates (scattering angle and clock angle) to the individual pixels of the photographs. Unfortunately, no starfield calibration photos or position data for reference objects in the photos are available. Nonetheless I tried to estimate the three orientation angles for one of the images (2nd photo from 18:24) using azimuthal positions of roof-edges etc. as calculated from Google Maps aerial pictures and additional constraints such as the vertical orientation of lampposts and the approximately constant scattering angle of the secondary bow. The lens distortions (deviations from the ideal rectilinear projection) were corrected with predefined, lens-specific data in the RAW converter software UFRaw. Though this estimation procedure is only an error-prone stopgap solution (compared to a true calibration with a starfield image) the results are quite convincing. 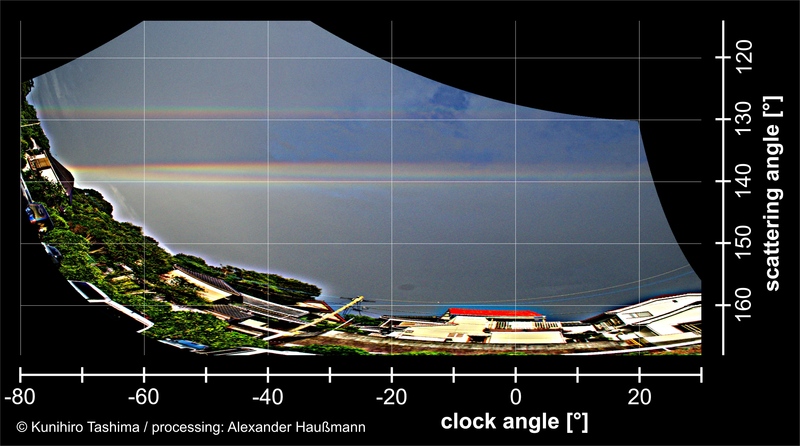 This can be seen best when the rainbow photos are morphed into an equirectangular projection in scattering coordinates (0° in clock angle = rainbow vertex). I calculated such projections for the 1st and 2nd photo from 18:24, as well as for the last photo from 18:32. The orientation angles I only estimated once (for the 2nd picture from 18:24), whereas I pursued a “dead reckoning” approach using some reference objects to transfer the initial orientation calibration (including its errors) to the other two photos. This allows for a consistency check of the method by evaluating the last picture which shows an ordinary rainbow display. The non-split primary appears, according to the expectation, as an almost straight line with only a slight curvature towards the antisolar point around its vertex. With the orientation being now somewhat trustable, I took a closer look at the finer details in the triple-split bow. The uppermost branch of the primary is shifted by approximately 1° for clock angles > –60° into Alexander’s dark band, i.e. towards the secondary, when compared to its left foot at around –70° in clock angle. Such a behaviour cannot be explained by the current theory for rainbows generated by flattened drops, since it predicts an inward shift of the primary at its vertex, i.e. away from the secondary, for this elevation of the sun. Elongated rather than flattened drops will yield a shift towards the secondary, but such shapes far from the equilibrium are not stable and will occur only temporarily during drop oscillations. Since these oscillations have periodicities in the range of milliseconds for common raindrop sizes, it is doubtful that a well-defined rainbow, required to be stable over the typical exposure time of a camera (or the human eye), can be generated by oscillating drops with considerable amplitudes. Obviously, such oscillation blurring will be reduced for smaller amplitudes as the oscillations damp out over time, but simultaneously the drop shapes will converge towards their flattened equilibrium states. Summing all up this means that Kunihiro’s pictures do not only represent the first photographic proof for multi-split bows, but will also give the rainbow theorists something to think about. It might be that we have to take into account additional influences such as electrostatic fields, refractive index variations, or anomalous wind drag. Posted on March 11, 2015, in observations, rainbow and fogbow. Bookmark the permalink. 3 Comments. Beautiful find. Note that the secondary bow remains unsplit as expected from ray tracing.